My Dad has remarked on more than one occasion that he was very moved by my post about a gladiator helmet discovered in the ruins of Pompeii. He described the way that seeing the actual object, depicted in paintings and on screen, brings history to life. I've had the same experience looking at a painting of a noblewoman with a prayerbook, and seeing on the next page a photograph of the actual prayerbook she was holding. In some sense, it's the equivalent of the human wormholes I blogged about yesterday. But my best example occurred during a visit to the National Gallery of Art with friends Jody and Franck to see an exhibit about Pompeii. 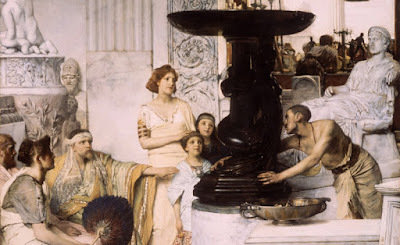 On the wall hung an oversize painting (IMAGE ABOVE) by Dutch-born British artist Sir Lawrence Alma-Tadema (1836-1912) in which he portrays ancient Romans being shown works of art for purchase. Before the canvas stood the very basin depicted in the painting. As I learned just now, the support for the basin was made in the 19th c. like Alma-Tadema's painting. But the basin atop it dates from the 1st c. B.C.E. to the 1st c. A.D. and was found during the excavation of Pompeii.